Your dog is your pride and joy, so it makes sense that you want to make sure he’s as happy as can be, right? A lot of dog parents feel nervous about leaving their furry friends home all day, even if it’s just for a few hours, and you’re not alone with that. We feel anxious and nervous about them being home alone by themselves, not understanding what’s going on or why their human has left. And, dogs feel that worry to, causing them to suffer from quite a lot of separation anxiety. If you’re worried about your Jack Russell suffering from separation anxiety while you work the day away, here are some things to do to help prevent it. From the beginning of your dog’s time with you, get him used to a crate. Make sure you associate the crate only with good things. Leave the door open to the crate so that he can check it out on his own time. If you do it right, you’ll find that he’ll be spending time in there on his own, snoozing and chewing on a toy. When you leave, shut your dog in the crate, but make sure you have trained him to be in the crate with the door closed before – don’t just surprise him with a closed door when you leave the house. Sturdy crates such as MidWest Life Stages Folding Metal Dog Crate work the best but be sure to put in a comfy pillow so your dog can lay somewhere while you’re away. It a great idea to put some padding on the sides. Also, don’t forget to put a water bowl inside so your dog can reach it any time. Dogs pick up on our emotional changes more than we realize. So, don’t make a huge thing out of leaving with tearful cooing and lots of snuggles. He’ll become anxious because he’ll pick up on your attention and then worry when he’s left alone. Your leaving will be then associated with his worry. So, stay cool, give him a pet and a treat, if you want, and shut him calmly into the crate. If you stay collected, he won’t have any reason to panic or get upset in the first place. If you notice that your dog is having trouble when you leave him alone, consider buying him a special toy or treat that he loves and reserve it for when you leave the home. Instead of associating your leaving with a bad feeling, he’ll connect it to his favorite toy or treat instead, and a lot of the anxiety should resolve itself this way. It’s all about association, remember! Toys that can be stuffed with treats or peanut butter like KONG Classic Dog Toy work the best as they provide fun and treats in the same time. Have them prepared – stuffed and frozen to have on hand. Be sure to choose a toy adequate for your Jacks’ chewing habits. 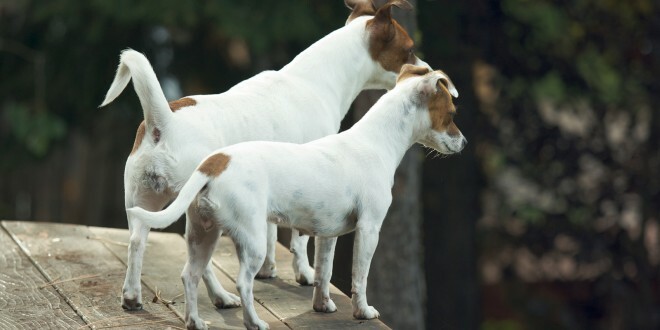 Jack Russell’s love being active and running around with you as you go about your day. So, if you know you’re heading out for a 8 hour work day, make sure he gets a good walk in the morning, or at least some time to play with you in the backyard before you go. When you get home, do the same thing. If your dog is idle, he’ll have more of a chance of being anxious and worried when you’re gone. So, make sure he’s plenty exhausted and ready for a long snooze while you head off to work. All of your dog’s natural separation anxiety won’t go away overnight. Give your dog some time to get used to the fact that you will be back each time, and eventually he will learn to trust you and your return, especially if he has plenty of exercise and something to keep him occupied. If you feel that you’ve given him enough time, however, and he’s still not adjusting, consider getting a second opinion. When you get back, odds are that your dog will chase you around and whine. Other than giving him a pet on the head as a greeting, do your best to ignore his behavior. You’re basically telling him “Calm down, so I was gone, it’s no big deal. I’m back now.” and he will get the message and start to self-soothe. Your dog is capable of being alone, remember that! So, don’t be there for every whine and whimper that he makes when you return. If you get home and find that your dog has messed in his crate or destroyed his toy, don’t freak out at him. As mentioned, it’ll take some time before he’s able to relax and know that you are coming back each time you leave, so don’t make the “leaving” association worse by punishing him. If you find that he is constantly destroying toys, try to exercise him more beforehand – he may just be bored! Last but not least, be patient with your pooch! Depending on backgrounds and puppy-hood, your dog will take time to adjust to being left alone. Even if you do everything right, your dog may never be used to being alone without panicking. Consult a professional, or try to minimize your separation from him. The trick is to remember that your dog is a person, too, so consider his feelings. With these eight tricks as your guide, you should be able to help your dog adjust to you heading out to your work day. You go to your job, and he’ll go to his!